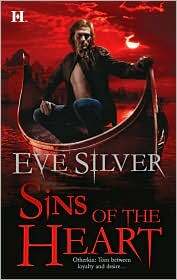 This past weekend, I read Eve Silver's newest book, Sins of the Heart. It's book one of her new Otherkin trilogy. I enjoyed reading her latest paranormal. It was interesting to see bits and pieces of various beliefs regarding the underworld and hell meshed together in Silver's new world. The heroine's loneliness felt a bit spoon-fed. Yes, she's been alone since she's been a teen. Why doesn't she try to make friends though? What's stopping her? The relationship between the hero and heroine seemed more one-sided. The hero seemed to be the one doing more of the giving then the heroine, but I guess you could assume that was due to the heroine being afraid to connect since she'd lost her family when she was young. However, I do like the new world Silver has put together, and I'm interested in seeing how the overall arc of the story resolves itself as well as how the other soul reaper brothers meet their fate. My take: . There's also an electronic prequel, Sin's Daughter, that I'm mulling over whether I want to buy.